I can't believe it is Wednesday already! Since it is Wednesday, I am sharing what is on my work desk with you. The desk is in stamping mode as you can see. There is a little boy who is celebrating his birthday this weekend and I was asked to make his birthday card. When asked what he wants for his birthday he answered "A lizard, cat, dog and a squirrel!" So I am going to incorporate those animals into a card. 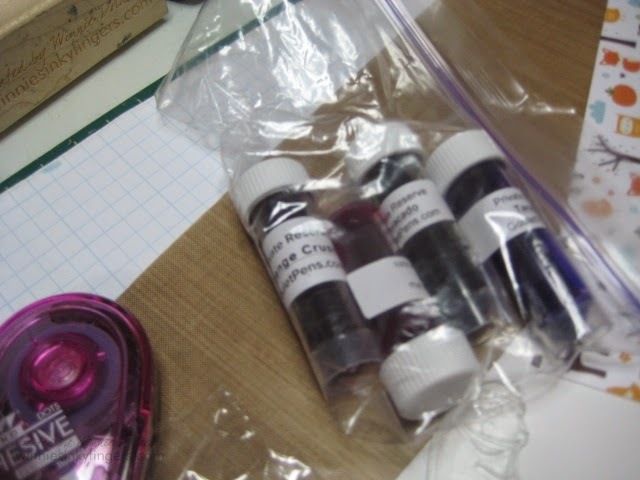 Also sitting on my desk is a new supply of fountain pen ink samples waiting for me to fill my pens with! I am really loving sampling inks. It is an inexpensive way to get my ink fix! I am looking forward to visiting with a lot of you today and catching up on what you are all working on. Happy 5th Anniversary to WOYWW and a very special THANK YOU to Julia for making this desk hopping fun possible! Ha ha! What a great response to the old, "what do you want for your birthday?" question! 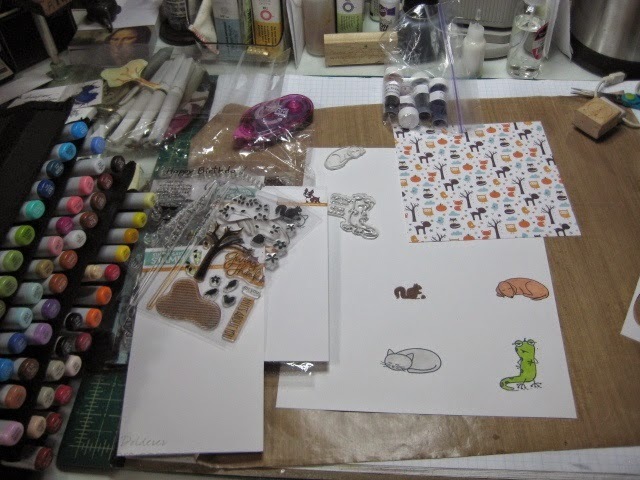 Looking forward to seeing the finished card in all it's lizard, cat, dog and squirrel glory! Haven't been to WOYWW in forever but can't wait to see what you do with this good stuff here! Thanks for the visit to my "home" and your lovely words. Hmmmm that's an interesting choice of birthday presents!! Don't forget tot ake a photo of the finished card for u!! Your desk looks lived in, lovely. I am sure he will be delighted with such a thoughtful card! Thanks for your visit and your lovely comment. I am glad you like both the teabag art and my knitting. Hop over to my blog again to see what a lovely time we had celebrating Mum's birthday, and to see some photos of the food!!! It's exhilarating when everything's laid out and you're ready to go! Have fun creating the BD card. I imagine the card will be a hit! I like the sheet of paper on your desk - very cute! I have a card for a seven year old that I need to make. Luckily I have a bit of time! Thanks for sharing your desk with us this week! Happy belated WOYWW. I don't know what's more impressive, the fact you're combining all those animals or that you had stamps of all those animals in the first place. Oh I love the lizard, he's well, like a lounge lizard!! Great idea to incorporate the 'wants'...and kinda proves your stamp collections is rich, huh! If anyone can pull off a fabulous card with all those critters, it's you. Can't wait to see the final results! A lizard, a cat, a dog and a squirrel... how cute is that answer. I'm sure he'll be delighted with your card. Thank you for your sweet visit and comment on my blog. Wishing you a beautiful Sunday!